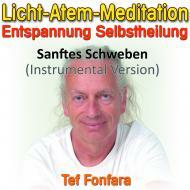 Sanftes Schweben - Mellow Floating Meditation (Musik aus Licht-Atem-Meditation) | Instant Music Licensing - we make you sound good. "Mellow Floating" - instrumental version of "Light Breath Meditation" with nature sounds without voices. Over 22 minutes of relaxing sounds from electric sitar to repose and dream. Also usable as background music in surgeries or for relaxing therapies or for any meditations. Original by Tef Fonfara.